Youll be exploring the beautiful Highlands of Scotland from a different, unique point of view. 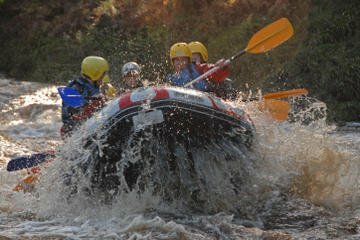 During the trip you will meet white water rapids up to grade 4/5 and discover 8 kilometres of the most beautiful river of Scotland; the Findhorn. Around lunchtime, which will also happen on the river, you’ll have the opportunity to do some optional cliff jumping from 5 to 30 feet. Professional photographs are available on the day. With a warm wetsuit, you will have the experience of a lifetime. This trip is suitable for everyone from age 13+.